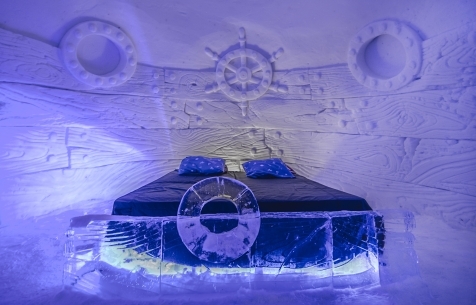 Perched at the top of the world is the SnowHotel Kirkenes. Now in its 11th year this is a firm favourite with our guests. An enthusiastic welcome starts with 110 howling huskies; the resident reindeer are a little more nonchalant, but no less friendly. You can then savour a cocktail of adventures. Catch a King Crab, Ice Fish with the experts, dash across frozen fjords or go in search of the Northern Lights, before you kick-sled your way to dinner and then retire to your snow room or designer aurora cabin. Fly to Oslo and overnight at the Comfort Hotel Runway, Gardermoen Airport. 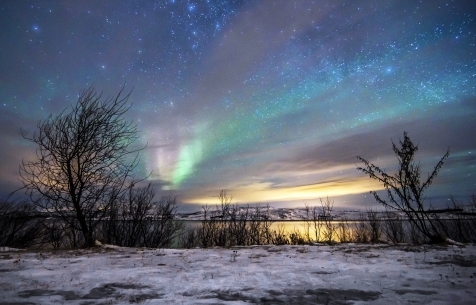 An early morning flight ensures you arrive in Kirkenes with a full day ahead. Upon arrival transfer to the SnowHotel. On arrival you will be given your protective thermal clothing, which is for the duration of your stay. It is then time to meet the huskies for your afternoon husky safari. As you approach, the enthusiastic barking signals the dog’s eagerness to get out onto the trail. Take a seat on your sled and head out into the surrounding wilderness. Returning to the SnowHotel you will be given a guided tour of your surroundings and a welcome drink. A delicious 3-course dinner comprising of the best local ingredients is served in the beautifully converted 'Hay-Loft' or 'Sheep Barn' restaurants, complete with wonderful views of the surrounding landscape. 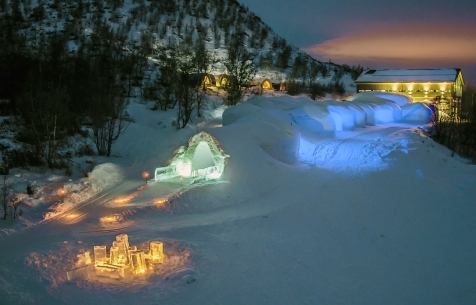 Take time to pop outside and perhaps catch the Northern Lights before retiring to you ice suite and a night sleeping in a giant igloo at the very top of the world. Enjoy breakfast and a warm-up sauna before your transfer to the Thon Hotel Kirkenes for the next 2 nights. The remainder of the morning is at leisure. In the afternoon prepare for sightings of the sub aquatic albatross of the Barents Sea, a King Crab resplendent with a 2-metre claw span. You will be picked up by bus at the hotel. From Namndalen you will travel by snowmobile sledge to the edge of the ice. Your driver guide helps you cut a hole in the frozen ocean and draw up the crab pods. Transport the catch back to the quayside and watch how it is prepared for cooking. Head to a local fisherman’s hut to enjoy your spoils. Return to the Thon Hotel late in the afternoon, with the remainder of your time at leisure. Enjoy a hearty breakfast before embarking on a 4 hour guided snowmobile tour. Driving in pairs, you each will have plenty of opportunities to drive and take photos along the way. A small picnic meal will be served along the way. On returning to the hotel there is time for some well-deserved R&R. Enjoy a leisurely breakfast and morning before your transfer to the airport in time for your flight home. Set down by the quayside on the edge of town the Thon Hotel Kirkenes is in an ideal location. These simply furnished yet comfortable rooms provide a warm and welcoming stay with many rooms offering a fjord view. The hotel also boasts a large restaurant with panoramic windows offering views over the Bøkfjorden. 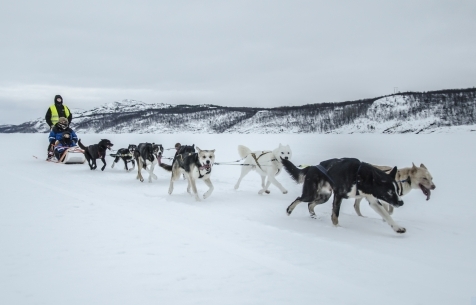 Start your adventure at the airport and have your own team of huskies waiting to take you directly to the SnowHotel Kirkenes. Pre-booking required. Each sled carries up to 2 people. Luggage travels separately. This transfer can be booked for day flights which arrive between 11:00 and 15:00. A 5-hour journey across frozen tundra taking you far away from light pollution in your hunt for the magical Aurora Borealis. There are plenty of stops for polar sky photo opportunities along the way, as well as a wilderness picnic dinner. A knowledgeable guide will check the latest Aurora forecast and decide where to head for the best possible chance of spotting the lights. 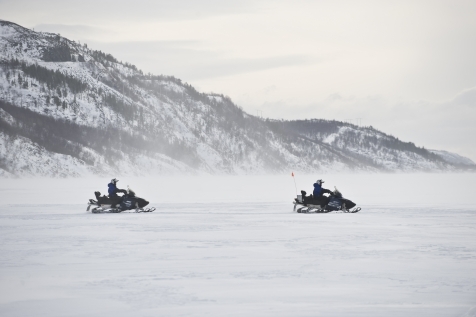 Full instruction is given on handling your snowmobile before you head off into the surrounding hills, where the darkness increases the chances of catching the Aurora. 2 people per snowmobile taking it in turns to drive. Return flights to Kirkenes via Oslo.